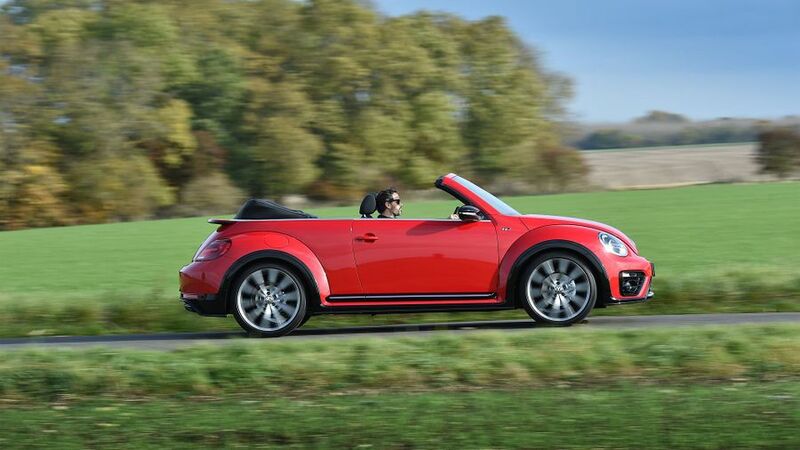 By any tangible measure, the Volkswagen Beetle Cabriolet isn’t a great car. It’s not very comfortable, it’s not very well equipped, it’s not very refined, and it’s not particularly affordable to buy or run. It does, however, have one important attribute that’ll make all that completely forgivable for some buyers: style. If you’ve fallen for those retro looks and that hippy image, you’ll buy one regardless. Best to keep it cheap with Beetle ownership. The cleanest version, but still not dazzling. Laughably expensive, especially for a Beetle. Interested in buying a Volkswagen Beetle? This will be the sole reason many buy the Beetle in the first place. Quite simply, if you dig the car’s cutesy, retro styling, you’ll probably want one regardless of any other factor. However, the entry-level car must miss the aesthetic mark for some. Although it gets body-coloured door mirrors and bumpers, it doesn’t get colour-coded door handles and alloy wheels. Design models check those particular boxes and add front foglamps, while R-Line models come with a sportier bodykit and lashings of gloss black trim. Dune models opt for a more SUV-style look, with a raised ride height, chunkier bumpers, wheel arch protectors and silver elements on the diffuser, door mirrors and side sills. On the face of it, there’s a great deal of glitz on show inside the Beetle’s cabin. Everywhere you look, there’s another high-gloss panel or swanky metallic trim piece, and it all helps give the car’s inside as much character as the outside. That said, some of the materials used aren’t quite up to the standards of those in other Volkswagen models. All the plastic surfaces are hard to the touch rather than being cushioned, and some have a rather hard, grainy finish. In fairness, though, these are hidden away well enough that the overall feeling of quality and solidity isn’t betrayed too much. 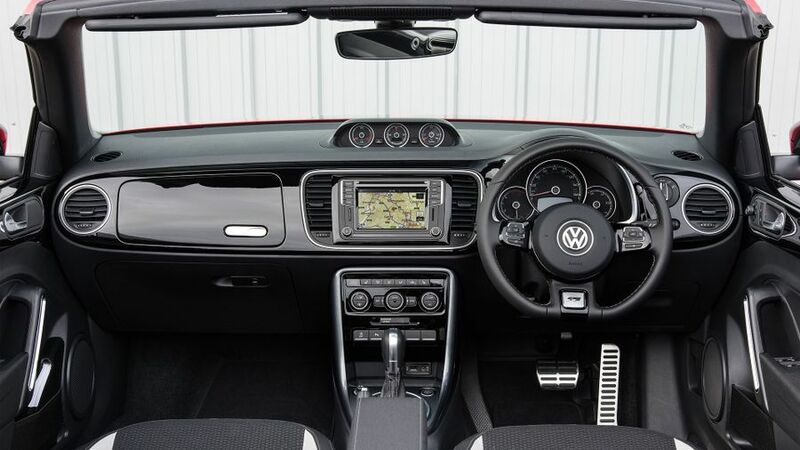 The layout of the dashboard and instruments is typical Volkswagen, which means using it is as intuitive as breathing in and out, and there’s decent storage laid on for odds and ends. However, limited adjustment in both the driver’s seat and the steering column could make it tricky to find a comfy driving position, and your over-the-shoulder visibility is pretty useless with the roof up. 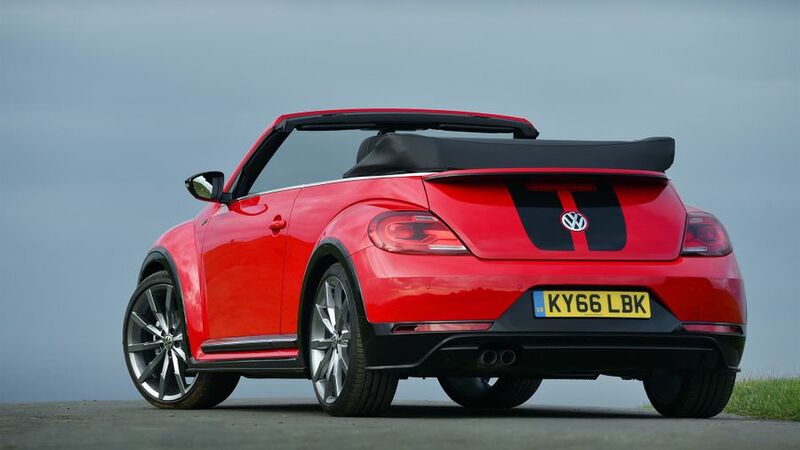 Many four-seat convertibles are rather ‘optimistic’ about the number of chairs they realistically offer, but although sitting in the back of the Beetle is undeniably snug, it’s not inconceivable that an adult or two could squeeze in if needed. Leg- and shoulder-room are both adequate, and even head-room is pretty good with the roof up. The boot isn’t quite as impressive: it’s pretty small at 225 litres, and it’s also oddly shaped and hard to access through a small and strangely shaped opening. Split-folding rear seats that let you extend your cargo area into the cabin come as standard, but the aperture through which you have to load your items is laughably small and awkwardly shaped. Still, at least you don’t lose any boot capacity when you drop the roof. 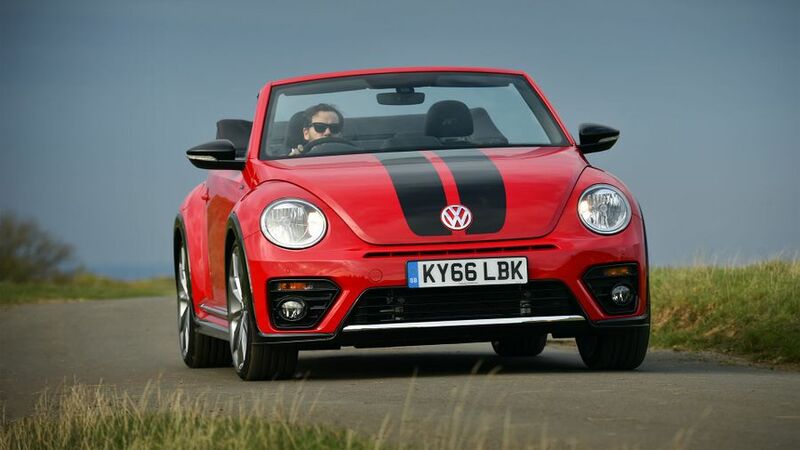 Unfortunately, the Beetle Cabriolet doesn’t really impress on either front. The ride is the biggest issue – which is problematic as that’s the more important aspect with a car like this – because the suspension never really settles over even minor surface imperfections, meaning the car jitters and jolts its way along too much of the time. Even worse, the absence of a solid roof means the bodywork is prone to shake and wobble on anything less than a mirror-smooth surface, which further impacts your level of comfort. So does the cacophony of squeaks and creaks made by the fabric roof: drive the car along a rutted urban road, and it sounds like you’re being heckled by a flock of angry chaffinches. What’s more, drive with the roof down at any real speed, and you’ll be buffeted mercilessly by the wind. The handling remains stable and assured most of the time, but mid-corner bumps can knock the car off line rather easily, and they also cause pretty severe kickback through the steering wheel. The steering also feels pretty slow and remote, which further dents the fun you’ll have. 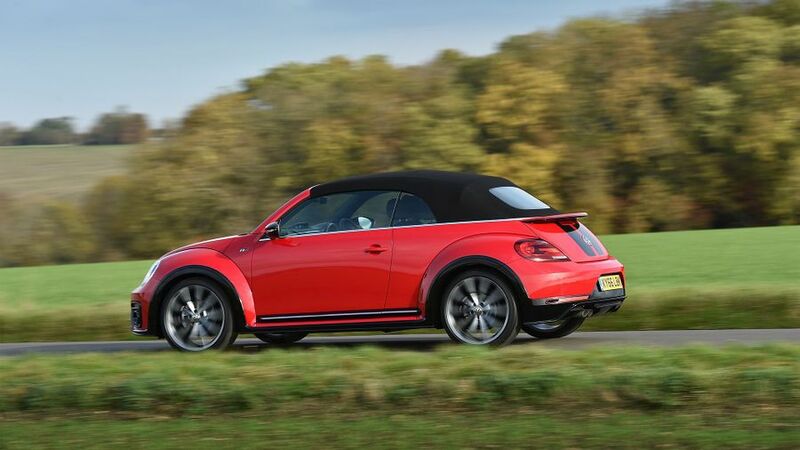 Several turbocharged petrol and diesel engines are available in the Beetle Cabriolet, but so far, we’ve only tried one, the range-topping diesel. It’s the same 148bhp 2.0-litre currently plying its trade in the vast majority of Volkswagen Group models, and it behaves in much the same way here. It’s reasonably smooth and quiet unless you’re really beastly to it, and it provides a good spread of smoothly delivered power, keeping your progress nice and relaxed. However, one area in which it differs in the Beetle compared to some other VW products is the way it works with the six-speed twin-clutch gearbox fitted to our test car. It feels a little hesitant and lazy when swapping up or down the gears, and things don’t feel much more urgent when you select the Sport mode. It just hangs on to low gears longer, which only serves to make the engine noisier. Purchase prices for the Beetle aren’t ruinous compared with some convertibles, but don’t go thinking it’s a cheap car; it really isn’t. Resale values aren’t as solid as you might expect, either, which won’t do your long-term ownership costs many favours. The engines are all fairly economical in other VW models, but the hefty weight of the Beetle Cabriolet’s body puts a sizeable dent in that. Even so, all but one of the petrols return more than 50mpg, according to the official figures, while the majority of the diesels beat the 60mpg mark. Volkswagen is a brand that has a reputation for reliability, but that’s arguably more the result of a clever advertising campaign several years ago rather than any tangible fact. One look at the Warranty Direct Reliability Index will show the brand languishing in the bottom half of the manufacturer standings, although the Beetle itself doesn’t have too bad a score. It’s worth noting, almost half of the faults suffered by the Beetle are electrical, so keep your eyes peeled for any strange glitches. The Beetle comes with all that mandatory stuff you need to have as a legal requirement, like airbags (four), electronic stability control, and a tyre pressure monitoring system. However, the car doesn’t go much further than that. There’s no autonomous emergency braking or, for that matter, any of the latest clever electronic safety measures. A blind spot monitoring system is about as clever as it gets, and even that’s an optional extra. The Beetle hatchback did achieve the maximum five-star rating in Euro NCAP crash tests, but that was way back in 2011, and the tests have become much, much tougher since then. The entry-level Beetle comes with air-conditioning, a powered roof, four electric windows, and a touch-screen infotainment system with DAB and Bluetooth. Design models add leather covering for the controls and a slightly upgraded stereo system, where R-Line models add climate control, ambient lighting, cruise control and parking sensors at both ends, as well as sportier styling touches inside and out. As well as the SUV-inspired styling elements, Dune models come with automatic lights and wipers and sportier dials. It’s perhaps a little surprising that all versions of the car make you pay extra for sat-nav and leather upholstery, especially as this isn’t a particularly cheap car in the first place. 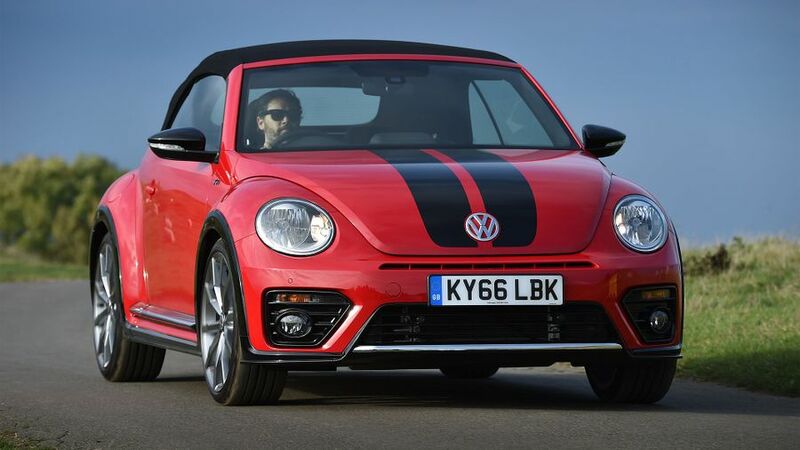 Because you’ve fallen for the Beetle Cabriolet’s retro styling and open-air appeal, and you’re prepared to forego comfort, refinement, luxury equipment and affordability in order to get them. Not our favourite mid-size convertible – far from it – but there’s no denying the style.